Meg here and it seems that every other weekend has a new trade show on the schedule. Whether you’re a veteran of these shows or you’re new to the experience, this guide will help you be as prepared as possible. Pre Show Prep - Take some time to meet with your trade show team and work out what you’d like to accomplish during your time at the show. Are you planning on introducing a new product or service? Are you trying to keep attendees up to date and knowledgeable about your company? Maybe you’re looking to scoop up a few new clients and bring your service to a new region. Be sure that you and your team have a clear understanding of your goals before you begin your time at the show. Keep a List - There are some trade show supplies that you just can’t do without! I always make sure to place an order of some key items before the show so I can make sure our team is stocked and ready. On my list are Avery Address Labels to keep everything organized and clearly labeled. I also keep plenty Pilot Gel Ink Pens on hand throughout the show. There’s nothing worse than trying to take notes with a pen that’s nearly out of ink! Finally, I always make sure each team member has a Deflect-o Desktop Business Card Holder. Trade Shows are key for networking and it’s so important to be prepared with plenty of business cards! Keep a Schedule - Are there certain speakers or events that your team can’t miss? Keep a clear itinerary of all the events that you need to attend. It also helps to keep a few time slots open for flexibility and down time. 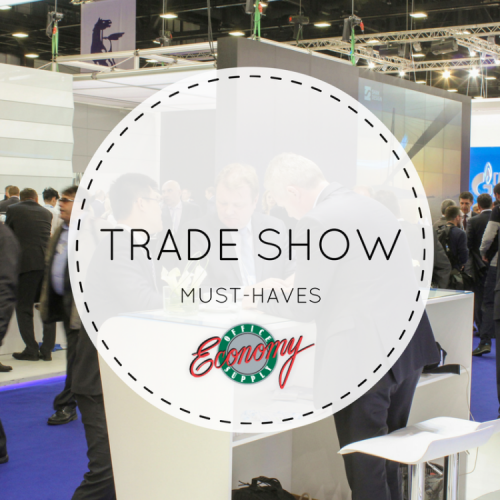 Trade shows can be a busy time and it’s important to put aside a little time for a break. Need a little more inspiration for trade show season? Take a look at these tips from the Huffington Post.